There’s no place I’d rather be than Michigan in the summertime. But in February? Blecch. I really hate February. It’s cold. It’s snowy. The roads are icy. The traffic is bad. The school closings and sick days wreak havoc on our family routine (which is already questionable at the best of times). And the darkness. *Shudder. * Oh, the darkness. Let’s face it: February in Michigan is a soul-crushing experience. How does any one of us cope, you may wonder? Let me count the ways. 10. Grab a book and go to bed early. Sure, you could watch Netflix on the couch with a glass of wine after the kids are tucked in. But wine looks every bit as nice on a nightstand as it does on a coffee table, and I think we can all agree that bed is just a more comfortable place to be on a February night. 9. Get some fresh air. Walking from your car to the office building doesn’t quite cut it. 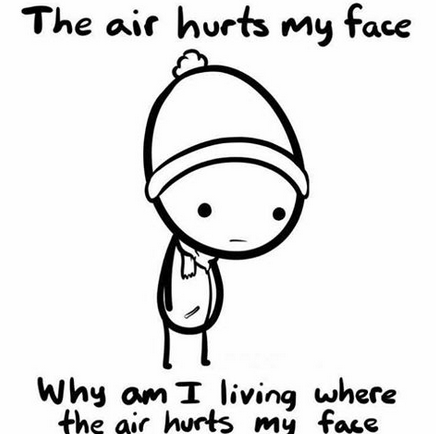 Yes, the air hurts your face. Drink it in anyway, at least in small doses. Think of it like medicine. It isn’t pleasant, but it’s good for you. 8. Exercise . . .
7. . . . or don’t. Who are we kidding? Bathing suit season’s still months away, and until the snow melts, you’re probably going to want to hang on to every inch of the extra insulation you packed on over the holidays. 6. Plan a read-aloud date night. Sure: you were going to take each other out for dinner and movie on Valentine’s Day, but to do that, you’d first have to shovel the driveway and scrape off the car, and really, it’s just so much trouble. Wouldn’t you rather stay in with a bottle of champagne while you listen to the mellifluous voice of your sweetheart reading to you from the collected works of Jane Austen? Aw yeah. 5. Cook warming soups . . .
You know those soups that simmer for four hours and heat up the entire kitchen before warming the very cockles of your heart and frigid toes? Those are going to seem absolutely repugnant in July. Better enjoy them now. 4. . . . or don’t. 3. Read chapter books to your family. Come summer, they’ll probably all be outside late into each balmy evening. (SIGH!) So while this wretched winter lasts . . . and lasts . . . and lasts . . . why not embrace the cabin fever and use the long evenings cooped up with them to tackle a few chapter books? Harry Potter should help you while away a few (dozen) evenings. Or how about Laura Ingalls Wilder’s The Long Winter for a little sustaining schadenfreude? If you’re into Eerdmans books (as we certainly are) try The Cricket Winter or A Dog Like Sam for some cozy midwinter togetherness. 2. Soak up every ounce of available sunlight. Is there sunlight coming in through the window? It won’t last, so you’d better make the most of it. Drop the chores you had planned to do, put on a t-shirt and shorts (if you can find them), grab a towel, and lay out in a sunny spot on the living room rug—with a good book, of course. Eight minutes later, when the sun goes back behind the clouds, you can go back to whatever useful but ultimately pointless thing you were doing before. 1. Call an impromptu picture book snuggle party. Pick a number between one and ten. Have each child choose that many picture books to add to the stack. Be sure to add a few ringers of your own to water down the inevitable Disney princess/superhero overload. (My personal go-to favorites? 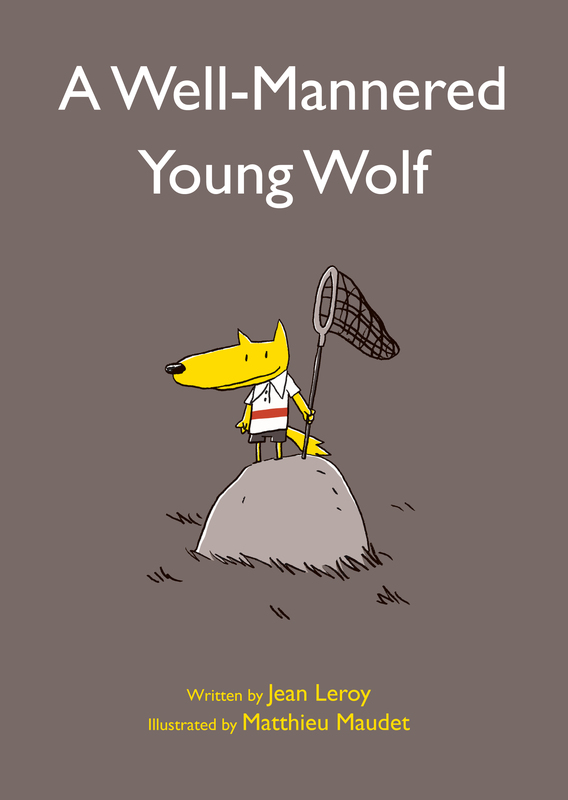 Roger Is Reading a Book and A Well-Mannered Young Wolf.) Then cuddle up on the couch with a pile of pillows and blankets and read until the books are all gone. Let’s face it: your throat is already raw from the cold, dry air and a perpetual succession of irritating little viruses. What have you got to lose? So there you have it: my top ten favorite ways to survive February. Good luck, everyone, and happy reading. If you need me, I’ll be in bed.